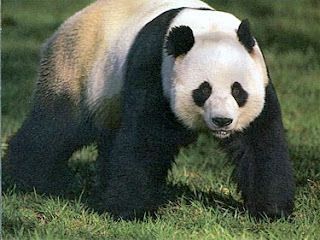 Animal Wildlife | Giant Panda Bear | The giant panda bear is native to the mountainous regions of central and southern China. 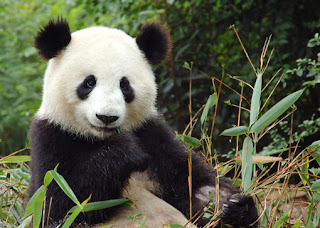 The giant panda would have once inhabited more lowland regions like jungles and grassy plains although the giant panda is now restricted to the higher mountain areas due to increased farming and habitat destruction in the lowlands. 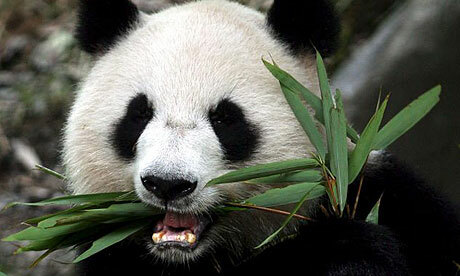 The giant panda bear is an omnivore eating a range of things from honey, to fish and small mammals. 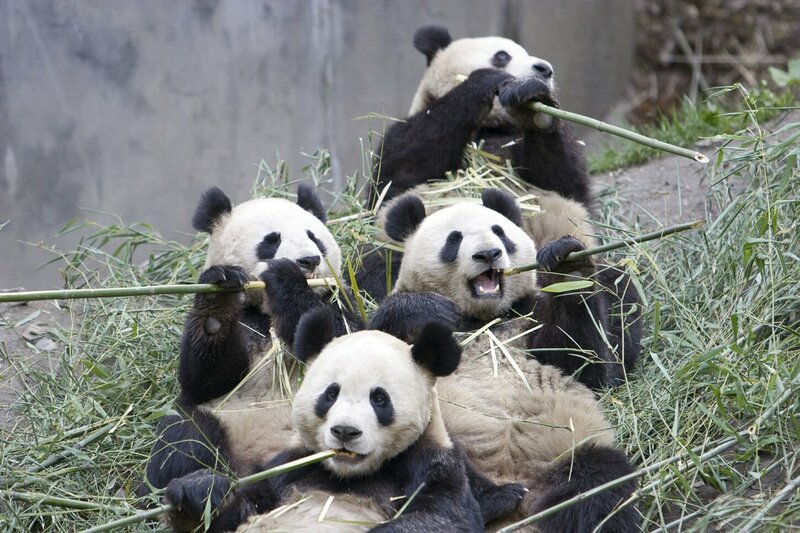 The giant panda bear's diet consists of roughly 95% bamboo, which the panda bear needs to eat as the bamboo plays a crucial part in the giant panda bear's digestion and water intake. Today the giant panda bear is considered to be an endangered species with only 1,500 giant pandas thought to be left in the wild. Giant pandas are fairly docile bears as the giant panda rarely comes into contact with people in the wild. However, the giant panda bears have been known to attack humans when confronted particularly when the giant panda bear is kept in captivity. Due to the giant panda bears soft and cuddly appearance, there has been a number of instances in zoos worldwide, where humans think the giant panda bear is cute and therefore enter the giant panda bears enclosure. These instances generally end with the tourists getting a nasty bite from the surprised, and generally sleeping giant panda. 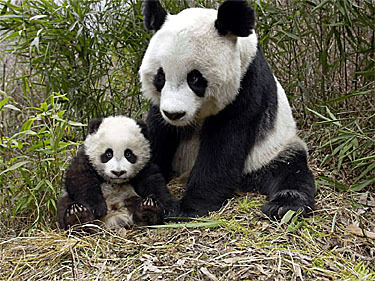 Despite the fact the average adult giant panda bear weighs around 150kg, when a panda bear cub is first born, the giant panda cub only weighs around 100g which is the same weight as a small mouse! The giant panda bear soon grows and generally reaches the full giant panda size within the panda bear cubs first few years. Scientists believe that the giant panda bear populations are today rising, due to increasing awareness of the importance of protecting one of the most beautiful bear species in the world. Some believe that are there could be as many as 3,000 giant panda bear individuals in the wild which is double what they first anticipated, although the giant panda bear is far from being taken off the endangered species list. In recent years that giant panda bear has become an extremely important icon for China, a country who generally regard the dragon as being its main national emblem. The Chinese people have begun to use the giant panda bear more and more on flags and emblems and are keen to help to promote the conservation of the giant panda bear. As with most bear species, the male giant panda bears are generally much bigger than the female giant panda bears and are thought to be territorial animals. The giant panda bears spend most of their waking life roaming the bamboo forests high in the Chinese mountains, searching for food. 0 Response to "Giant Panda Bear"